After several years fishing The Bay Of Quinte and studying fish behavior and habitat (mostly walleye) I have come to realize that I have been so focused on trying to create a successful guiding service, that I have almost missed out on a very important part of my children’s education. Getting MY kids involved in the fishing world. I find it can be very rewarding, not just for them but for me as well. I wanted to talk about the pro’s of getting kids involved in the fishing world and what it means. 1 – you are connecting your children to the out doors, creating life skills and learning about our history. By taking your children fishing you are getting them off the couch and into the outdoors. Teaching them a basic survival technique which I personally believe, all Canadians should know, and experience, at some point in ones life. Fishing is a part of our Canadian heritage and teaching a child to fish is a very natural & rewarding activity. It is easy for parents to be consumed with having their child playing all the sports and joining all the clubs they can to gain a competitive edge. Yes, you do spend time with your kid in the car from one club/team to the next, and they do learn valuable skills, but I don’t believe that this is quality time spent together. As a parent, you still need the one on one time with your kids, and that doesn’t mean cheering at them from the side lines, it means connectivity, 1 on 1. Giving undivided attention while waiting for that fish to bite or walking the shore, side by side, which lets your child know they didn’t have to win the game for you to be invested in them. 3- Fishing teaches co-ordination, safety, decision making skills, and much more . Each day is different than the last, offering a new lesson. Learning together to read weather conditions, habitat, water conditions, opens up great discussions bout lure and line selection. Hand and eye co-ordination is strengthened when precision casting, you can visually see your improvement each time you get closer to the target you actually aimed for. Knot tying is a wonderful skill for co-ordination and life in general. Water safety is a given, but also learning how to work safely with sharp objects. Safety in the wilderness is a lesson that can be geared differently to different age groups. The more you and your child do all of this together the better you will become as anglers and the stronger your bond will become with your children. Teaching the importance of conservation is an imperative part of the entire fishing experience. On a basic level it is a great introduction to why society has structure, but more importantly it shows how our actions today have reactions in the future. Teaching proper water, boat ramp, and shore fishing safety & etiquette are just as important as teaching habitat protection, waste disposal, and proper techniques on CPR (catch Photo, Release). It would be naive to think that fishing & boating does not have its impacts on its environment. I encourage everyone to take a visit to the following links so we are teaching our kids etiquette and conservation and have the answers to the questions they may come up with. Also, remember when river fishing, if its busy around you, don’t cast over someone’s line. If someone else hooks into a fish reel up to avoid tangles and arguments. If you are introducing a youngster to the world of fishing then remember children have little patience and get board easily. So try not to over do it because YOU may want to continue fishing. If you make children fish for longer than they want to, they will loose interest quickly and will not want to go again. In our family we have two terms ‘daddy fishing’ and ‘family fishing’. Daddy fishing equates to more then eight hours, family fishing usually tops out at three hours. You may be a patient angler but remember this skill when it comes to the children. If you are patient with them at the start, then you will have a fishing partner for life. If you have any comments of feed back about my blog please go ahead and comment below. Where Are All The Bay Of Quinte Walleye. 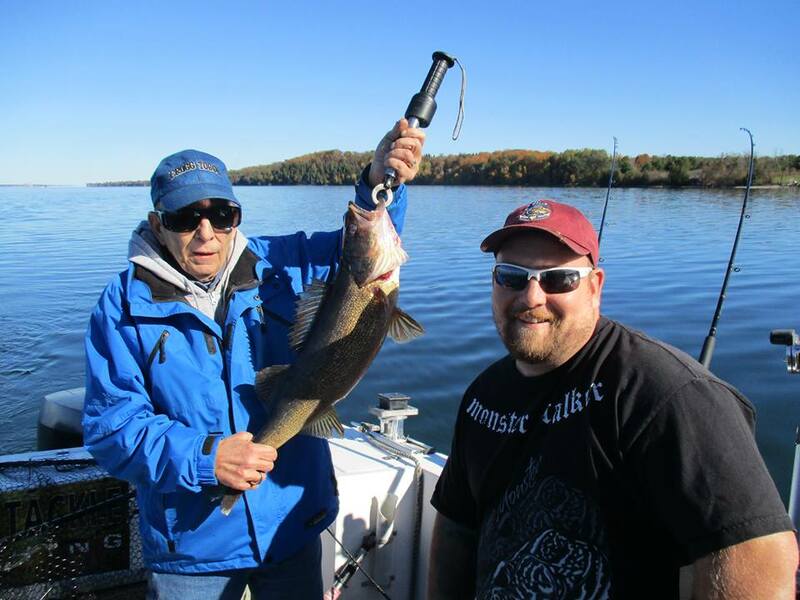 If you have travelled to The Bay Of Quinte this fall season to try your luck at the amazing walleye fishery that you have probably heard about, you may have found yourself wondering what all the hype is about? I have heard it many times this fall from people travelling from all over North America. The question, “So how was it?” The answer’s “Blanked, Skunked, Nothing today, bite is off, Slow, 1, probably better tomorrow” (or my favorite) and to be perfectly honest I have said this one myself LOL “WE LOST A GIANT”. (only in my case’s its always true LOL) well there is no denying it, up to now the 2015 walleye fishing season has been very poor on the Bay Of Quinte. here is what I am seeing out there on the water. In many cases in the Adolphus Reach area I am seeing a lot of fish on my graph, down very deep in the water column, down about 60 /80 feet and deeper. I am seeing the water temperatures have still not dropped like they normally do at this time of year. So In my personal opinion I believe that there are a good number of fish that have made their way into the bay from the open waters of Lake Ontario, however, I do not believe that the temperatures have dropped enough for the majority of the fish to have made their way into the bay yet. The walleye have definitely started the trek but they are in no rush to get to their staging areas where they feed heavily to bulk up for the winter months. With surface water temperatures hovering around the 49 / 50 degree Fahrenheit range we are still a fair way off from seeing the fish feel an ergency to bulk up for the winter months, a time where they feed heavily. I believe the walleye fishing will get a lot better over the coming weeks with the outside temperatures dropping significantly, maybe even in time for a Christmas walleye LOL. Even though Anglers have not been seeing the numbers of fish that they might be used to for the Quinte fall fishing Bonanza, the fish that are being caught have been quality fish and are sure to put a smile on ones face. After heading out onto Quinte these pat few weeks, I have found fishing to be hit and miss most of the time as turnover takes its course. However, yesterday, although slow to begin, ended up being a great day on the Bay. To get the Eye in the picture below onboard, it was a team effort by all members on the boat. congratulations guys in a successful trip out. I have been home now for a few weeks from the east coast and already so many exciting things are happening. Although I cannot share everything with you at the moment I can share a few of the things that have been happening. 1st just 2 weeks ago I had discussed with a buddy of mine that I think we should start fishing another species of fish. 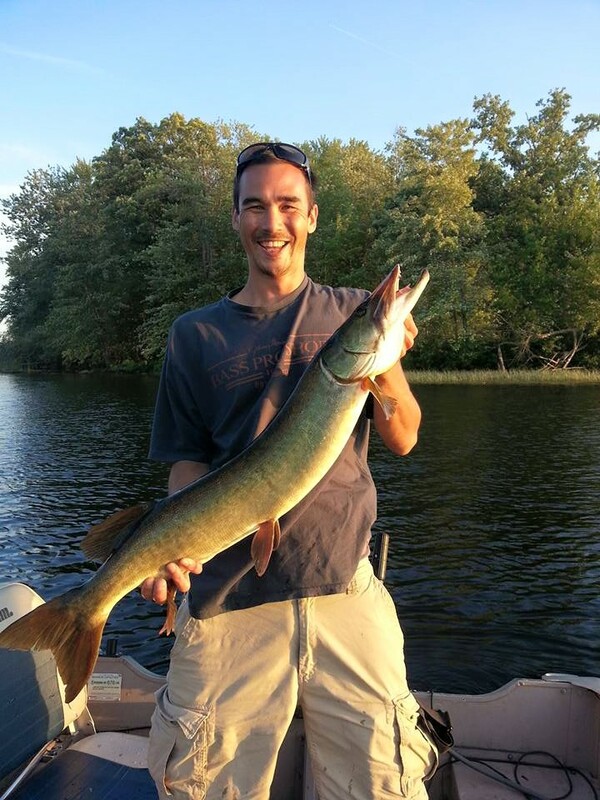 We had both been thinking of trying our hand at Musky fishingover the past couple years and now was the time to give it a shot. first we tried going to Lake Stoco and a couple of the surrounding rivers that surround the lake, only to come away with nothing more than a few small Pike. Not that there is anything wrong with catching a few Northern’s but not exactly what we were setting out to do. 2nd we decided to ask if my good buddy who is extremely knowledgeable in the art of Stalking Musky would want to join us for a hunt. so we were off to the lake again. only this time armed with our secret weapon (DAVE) LOL. 2nd I was able to land my third sponsor. Fishbum Outfitters has added me to their Field Staff. I absolutely love the clothing of this company. It is comfortable clothing with great designs, and made here in North America. check them out online, and get your Fishbum gear today. 3rd check out the cool new Bay Of Quinte Regional tourism guide. Today we caught word from the DFO that the Lobster fishery in our zone will be open as of Tuesday. 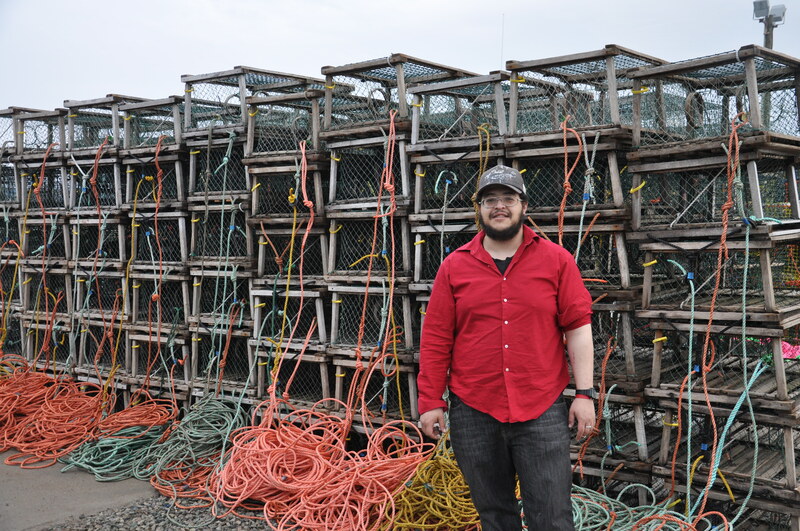 This means that we should be loading our boat with the first set of traps by tomorrow May 11th, and setting them first thing Tuesday Morning. Today was also mothers day, and yes I did get a hold of mom and didn’t forget although it is something I would normally forget. It seems that when you are away from family and friends for a long period of time that you spend a lot of time thinking about them so in my case I should probably head out more often, I might remember more important days this way lol. I was not forgotten myself either today Capt Andy stopped in just as I was settling down to a big bowl of Kraft dinner with hot dogs when he stuck his head through the door and asked if I would be interested in heading to town and meeting him and his wife for a lunch, on him. I quickly put my bowl of KD and dogs in the sink and through some socks on and was out the door. We went to a community Hall in Mabou where they were serving a buffet style mothers day lunch CAPT Andy had paid for my ticket and the feast was on. An excellent lunch and meet and greet with some locals, some great stories shared and then back to the warf to help Capt Jody get the boat together for opener. The New guy for our boat had also arrived in town today. A Palastinian / Canadian named Kallil ? I think, After helping the Capt with the boat I headed over the new guys place to meet kallil and to get his power and water on, I was half way from the warf and kallil’s place and I see a guy walking down the road a guy not from around here. I slowed down and the guy asked me how far to the wharf? I giggled and I asked if he was here to work for capt Jody, he was about 4 miles from his new to him dwelling, and another 4 or 5 miles to the wharf. Kallil’s car had broken down about 1.5 hours away, the transmition had blown so now he was here to work and no vehicle to get back and forth. Good on him to continue his way I thought.